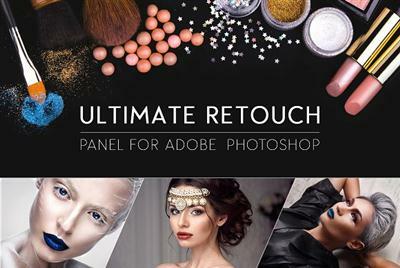 "Ultimate Retouch Panel 3.5 for Adobe Photoshop Win/Mac"
The Ultimate Retouch Panel (version 3.5) has been developing for two years. This is not the last update, because there's more and more new retouch tools and techniques. After the version 2.0 I started to listen to my clients (both photograghers and retouchers). They gave me many ideas of what to add to the panel from their points of view. So the Ultimate Retouch Panel is a product of not the developer only, but of many people from all over the world also. This fact makes the product unique, relevant and very flexible. At the moment there are more than 200 useful functions of the panel. It can become an essential part of your work flow and keeps you away from boring technical Photoshop settings and gives you more time to focus on your work. Ultimate Retouch panel includes blocks for the base correction, so for retouching, toning and color correction, effects and has 20 programmable buttons for your own action games. Now glossy touch-you can do in 5 minutes.